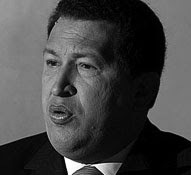 Hugo Chavez Frias was born in Sabaneta, Barinas State on July 28th, 1954. He has a mulatto background which gives him a common link to the 67% majority of Venezuelans. After he finished high school, he would have to travel to Caracas to continue his education. Chavez attended Venezuela’s Military Academy, where he graduated with a degree in Military Sciences and Arts on July 5, 1975. Having both parents as teachers its easy to see why he is an intellectual person, and why they weren't wealthy. Apparently his family also sold bananas and sowed corn for income. Chavez’ love for baseball is also easy to see. When he was a kid he played baseball like all children in Venezuela, and apparently he was a good pitcher. It was the desire to become a major league pitcher that initially led him into the military. After gaining his degree and his hopes of being a major leaguer gone, he continued on with his military career. During that time, he had various assignments, an armored unit, anti-guerilla duty along the Colombian border, and then as a military ethics instructor. Soon after that he began sowing the seeds for a coup in 1992. In 1982 he founded the Bolivarian Revolutionary Movement. Through 1989-1990, he studied Political Science at Simon Bolivar University in Caracas. “He led an unsuccessful military coup against President Carlos Andres Perez on February 4th, 1992, that launched him onto the political scene and, at the same time, earned him two short years in what he refers to as the ‘prison of dignity’" (gosouthamerica.about.com). In a display of support, “While Chavez was in prison, he videotaped a call for insurrection that was broadcasted at around four in the morning on November 27th, 1992, when a second unsuccessful coup d’etat was attempted” (gosouthamerica.about.com). Two years later, he was pardoned by President Caldera. Once Chavez was released from his conviction, he started to organize a political party called the Fifth Republic Movement (MVR), which would lead him to power four years later. “In November, 1998, a coalition of small leftist parties led by the MVR and under the umbrella of the Patriotic Pole won 34% of the seats in the National Congress and presented Chavez as its presidential candidate. After campaigning as ‘the scourge of the oligarchy and the champion of the poor’, Chavez came out victorious from the 1998 Presidential Elections with 56% of the votes­the largest majority in four decades (gosouthamerica.about.com). Chavez’ speeches and actions are extreme to the right wing political parties of Venezuela and the United States, causing skepticism about his policies. The following description of Chavez is not how most politicians would like to be viewed, "A populist leader backed by leftist parties, Chavez has advocated a ‘third way’ between communism and capitalism", wrote Patrick Moser for the Agence France Presse. 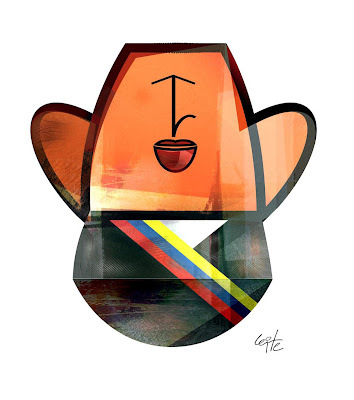 Since being elected, Chavez’ stile and personality have been very apparent. He has even managed to extend his love for baseball into politics. Chavez and Fedel Castro have played two baseball games, one when Chavez went to Cuba, another when Castro came to Caracas, with Cuba winning both games. Chavez pitched in both games for a few innings, while Castro, when he was in Venezuela took a turn at the plate. “To accelerate cooperation in Latin America, he visited Cuba, which has an antagonistic relationship with the United States, and he has a cordial personal relationship with Fidel Castro” (bjreview.com). Chavez’ relationship with Castro has been discouraged by the U.S. Chavez was also the first dignitary in ten years to visit Saddam Hussein in Iraq. These are the types of policies that have made him stand out. Chavez is very much a peoples man; he has a weekly radio show that is called “Hello President”, and television show dubbed “Face to Face with the President, as well as a paper. Through each one he talks to the people, giving his opinions and the agenda for the Government, he also takes phone calls during the radio show to hear peoples problems and responds to letters. “Chavez also likes to spice his often lengthy and unusual speeches with quotes from the Bible, French poets, military overtones and repeated references to Simon Bolivar” (www.bjreview.com). Chavez also displays a very hands on approach to his presidency. On several occasions he has been out in the poor communities giving land deeds to people for newly allotted land, inspecting the work of the military, and talking to the common men and women of Venezuela. In his personal life he is married and has five children. His wife works as a public official also; she was elected in 2000. He also enjoys going home, where his father is currently the mayor of the town.